1.Prepare Pickled Red Onion: In small saucepot, heat water, vinegar, sugar and salt to a boil over high heat; remove from heat and cool 8 minutes. Add onion; let stand at room temperature at least 2 or up to 6 hours. 2.Prepare Crostini and Grilled Peaches: Prepare outdoor grill for direct grilling over medium-high heat. Brush both sides of baguette slices with 2 tablespoons oil; sprinkle with salt and pepper. Place baguette slices on hot grill rack; cover and cook 3 minutes or until grill marks appear, turning once. 3.Brush cut sides of peaches with remaining 1 tablespoon oil. Place peaches, cut side down, on hot grill rack; cover and cook 5 minutes or until grill marks appear. 4.Place crostini in single layer on rimmed baking pan; top with cheese. Place pan directly on hot grill rack; cover and cook 2 minutes or until cheese melts. 5.Toppings: Drain onion, reserving 2 tablespoons pickling liquid in medium bowl. Whisk oil into reserved liquid; add arugula and toss to coat. Cut peaches into wedges. 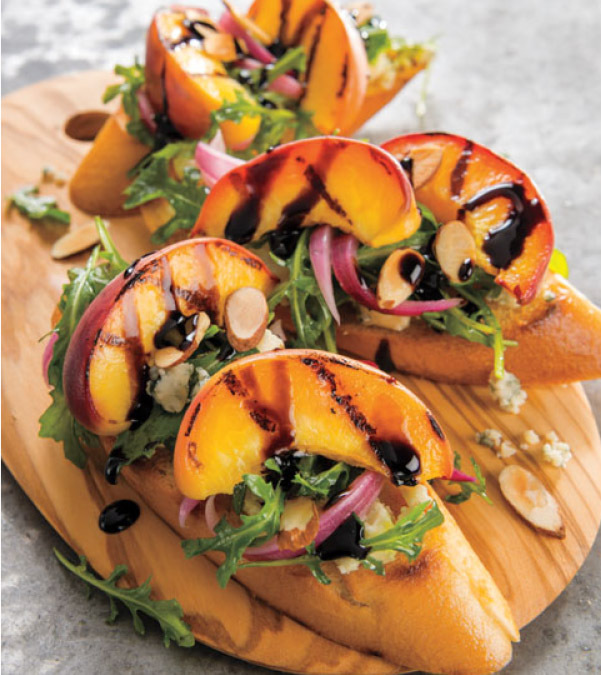 6.Top crostini with arugula mixture, onion, peaches and almonds; drizzle with balsamic glaze. > Crostini and peaches can also be grilled on a grill pan over medium-high heat. > To toast almonds: In large skillet, cook almonds over medium heat 3 minutes or until lightly browned and fragrant, stirring frequently; transfer to plate to cool.